In December we officially released an LTI-compliant Learning Management System (LMS) app to enable schools to integrate collaborative annotation in teaching and learning more easily. Already, hundreds of classes at colleges, universities, and high schools have installed the app and faculty and students around the world are using Hypothesis in their course work. 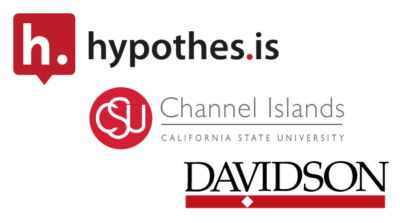 Today, we are thrilled to announce the first two schools formally joining the Hypothesis LMS App Pilot Program: Cal State University Channel Islands (CSUCI) and Davidson College. Both CSUCI and Davidson are widely recognized as cutting-edge innovators and thoughtful, responsible leaders in online and blended learning. Both schools, for example, were early to adopt the Domain of One’s Own model from University of Mary Washington. In 2017, CSU Channel Islands won the New Media Consortium Center of Excellence Award. Davidson has played a key role in the Harvesting Academic Innovation for Learners (HAIL) initiative. We’ll be working closely with the teams at CSUCI’s Teaching and Learning Innovations and Davidson’s Technology & Innovation in the coming months. We designed the Hypothesis LMS Pilot Program to be an authentic collaboration between our organization and educational institutions just like these. We aim to support partner institutions not only through the technical integration and implementation of our software, but also in the social and pedagogical aspects of introducing and making successful use of a new technology on campus. In addition to providing technical and pedagogical support, Hypothesis will include piloting schools in joint discussion about our education product roadmap and in the design and development process for new features. We will also convene pilot partners for regular online and face-to-face meetings at established gatherings, such as the EDUCAUSE Learning Initiative (ELI) annual meeting (19–21 Feb in Anaheim, CA), the Online Learning Consortium Innovate conference (3–5 April in Denver, CO), and the annual I Annotate conference (22–23 May in Washington, DC). If you’d like to check out the new Hypothesis LMS app, you can find installation guides for the various LTI-compliant LMSs at our LMS app landing page (Blackboard Learn, D2L Brightspace, Instructure Canvas, Moodle, Sakai, and Schoology). If you think your institution might be interested in joining our pilot program, learn more and reach out to education@hypothes.is. Technology & Innovation (T&I) aims to drive digital transformation that advances Davidson College’s primary purpose. T&I is responsible for facilitating college-wide technology strategy and planning, leading technology-driven innovations, managing the college’s technology systems and services, and partnering with students, faculty and staff members to use and apply existing and emerging technologies that support, enrich and transform teaching, learning, research and administrative processes.